The Mannie Jackson Center for the Humanities Foundation (MJCHF) held an open house for the Alma Irene Aitch STEM (science, technology, engineering and mathematics) Center on Wednesday, Dec. 6 in Edwardsville. A special program was held at the Mannie Jackson Center for the Humanities at 2 p.m. in honor of Aitch and the new STEM hub for Madison County. Southern Illinois University Edwardsville’s Chancellor Dr. Randy Pembrook and Dr. Sharon Locke, director of the SIUE Center for STEM Research, Education and Outreach, were among the event’s featured speakers. 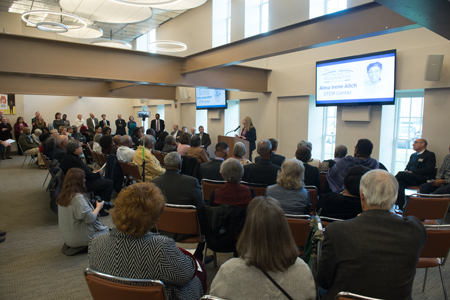 The Alma Irene Aitch STEM Center, named in memory of the education and social rights champion, will be home to programming which connects the human and technical dimensions of the humanities and STEM. SIUE’s Locke and program coordinator Candi Johnson will lead the Center’s “STEM Meets Humanities” program which will impact young leaders in underserved areas of Madison County. During the program, MJCHF President Mannie Jackson gave his comments on the new center and the importance of STEM education to the region’s youth. Digital Humanities Club teaches middle school students how to build and create content for websites via podcasts, documentaries and digital maps, with the goal of preserving local culture and history through technology. Jessica DeSpain, PhD, associate professor and co-director of SIUE’s Interdisciplinary Research and Scholarship Center (IRIS) is a major contributor to the program. Math Games League is being expanded after nationally recognized success in the Alton School District. The league gamifies mathematics through a unique competition that utilizes near-peer mentoring to engage and motivate young learners and foster a passion for the subject. It was spearheaded by Greg Budzban, PhD, dean of the SIUE College of Arts and Sciences, in collaboration with the national nonprofit organization The Young People’s Project. Urban Gardening is a program being offered in partnership with the Madison County Housing Authority. It emphasizes plant science and offers students the opportunity to learn cutting-edge urban gardening techniques, such as composting and hydroponics, as well as beautify their communities and create a sustainable food source. Robotics programming will creatively immerse high school students in fundamental computer science and engineering activities. The robotics work is aimed at using technology to enhance quality of life. Water Education is being offered in partnership with Lewis and Clark Community College’s Swarovski Waterschool. It will educate students about the human connection to and reliance on healthy and functional water ecosystems. “These programs ignite a passion for learning in interactive, community-based ways that will develop strong critical thinkers, decision-makers and humanitarians,” Locke said. “SIUE is excited for future programming opportunities that will be made possible by the co-location and collaboration that will occur at the Alma Irene Aitch STEM Center. Also speaking at the special program were Edwardsville Mayor Hal Patton, Lewis and Clark Community College President Dr. Dale Chapman and Assistant Regional Superintendent of Madison County Schools Dr. Andrew Reinking. Aitch’s nephew, Dr. Harry Shaw, was present to share his fond memories of aunt Alma. “Aunt Aitch was the long-term educator in our family. She instilled within us the need to expand our world views and our places in the world,” said Shaw, former associate dean at the University of Florida. “She stressed daily that in order to achieve success, we must have an education. She demonstrated through her life achievements and commitment to service that one person can make a difference." The Alma Irene Aitch STEM Center is located at the former Kraft Building at 1310 N. Main Street, Edwardsville, adjacent to the MJCH. Learn more at mjchf.org. Photo: Dr. Sharon Locke, director of the SIUE Center for STEM Research, Education and Outreach, highlighted the STEM Meets Humanities programming during the Mannie Jackson Center for the Humanities Foundation’s open house for the Alma Irene Aitch STEM Center in Edwardsville. (L-R) Edwardsville students Mercedes Mueller and Maximus Mueller, along with Jessica Tetzner, a sophomore studying computer science in the SIUE School of Engineering, demonstrated robotics for attendees touring the Alma Irene Aitch STEM Center.